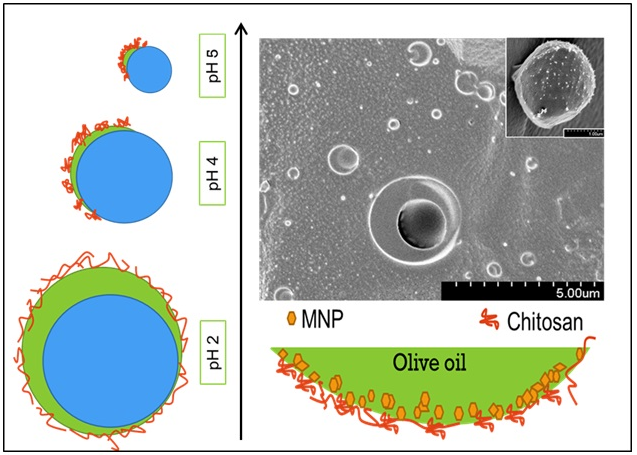 We report ultrasonically generated pH-responsive Pickering Janus emulsions of olive oil and silicone oil with controllable droplet size and engulfment. Chitosan was used as a pH-responsive emulsifier. The increase of pH from 2 to 6 leads to a transition from completely engulfed double emulsion droplets to dumbbell-shaped Janus droplets accompanied by a significant decrease of droplet diameter and a more homogeneous size distribution. The results can be elucidated by the conformational change of chitosan from a more extended form at pH 2 to a more flexible form at pH 4-5. Magnetic responsiveness to the emulsion was attributed by dispersing superparamagnetic nanoparticles (Fe3O4 with diameter of 13 ± 2 nm) in the olive oil phase before preparing the Janus emulsion. Incorporation of magnetic nanoparticles leads to superior emulsion stability, drastically reduced droplet diameters, and opened the way to control movement and orientation of the Janus droplets according to an external magnetic field.